Carbon Fiber Reinforced Plastics is increasingly adopted as material for civil and military aircraft because of the excellent strength-to-weight and stiffness-to-weight ratios and resistance to corrosion. However composite materials have some disadvantages, e.g. internal defects invisible on the surface caused by a low energy impact. These defects, if disregarded, could keep growing and cause the crash of the structure. Therefore, a new strategy for the Non-Destructive Evaluation of components must be set up, having as primary feature the reliability and effectiveness of the involved techniques. The capability to detect and characterise impact damage by using different techniques, such as Ultrasonic Inspection, Mechanical Impedance Analysis, Radiography and Thermography, is well documented in the literature. The results of many works demonstrate that the use of techniques, involving various equipment and utilising computerised systems, allows obtaining high sensitivities. The present work was originated by a comparative evaluation of different NDT techniques for the investigation of defects caused by low energy impacts on specimens made of CFRP. The same techniques were used on the inspection of structures of military aircraft as well, to evaluate the capability to discover damages that could happen during the in-service life of the aircraft. Composite materials with polymeric matrix and particularly Carbon Fiber Reinforced Plastics (CFRP) are increasingly used for structures and components of civilian or military aircraft due to their mechanical resistance, high toughness, reduced weight and immunity to corrosion if compared to traditional metallic ones. Thus, accordingly with non-homogeneous nature of the material, new aspects must be taken into account to ensure the integrity of the aircraft, as for example the frame pattern of the fibers. Hence, new methods for the Non Destructive Evaluation (NDE) must be established. During their life composite materials are exposed to various damages and their critical aspects have to be heeded. In particular, large delaminations between layers are generated by collision even at low energy due to falling tools, hail storm, flying birds or debris. This and other causes can give not only hidden delaminations but also cracks. Because of the low energy of the impact often the projectile does not indent the surface. So far, the impact damage may be underestimated. On the contrary, it reduces the loading resistance and may destructively propagate. Therefore, an effective and reliable NDT technique suitable for impact damages is highly desirable. Facing this problem, different NDT/NDE methods and techniques has been developed and tested. At first, methods such as IR Thermography, Ultrasonic Inspection, X-Ray Radiography and Mechanical Impedance Analysis were used to evaluate the damages on specimens at laboratory. The obtained results were compared among them and with the observation of the defects after the destruction of the specimens. It was found that the fiber plies are largely delaminated, immediately below the impacted surface but at a higher depth. 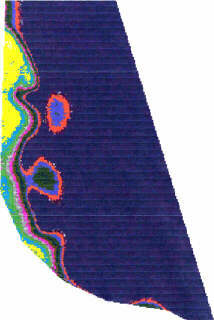 Often, even at energy of the order of 7-9 J, with tenth of ply laminates, the face opposite to the crash may present a crack with broken fibers. At lower energy, only internal delamination is originated and not at all visible signs on the surface. It is commonly assumed that total area varies linearly with the kinetic energy of the projectile . The second part of the project concerns the investigation of real aircraft structures by means of different methodologies, accurately analysed during the previous activity. This paper hints that only a sophisticated analysis allows mapping a real impact damage defect. Up to now, potentialities of IR Thermography, that is non-contact and fast, needing only a single-face access to the target, are very promising. The requirement of the searched NDE technique for the identification of damaged areas due to low energy impacts is the capability of recording the examined areas, indicating the extension of the damage and its depth. The goal of understanding if the fault is acceptable, considering the limits described by specific technical rules and standards. The sensitivity, referred to the minimum dimensions or the damage tolerance, added to the confidence level and the possibility to perform automatically the test are other important requisites. Anyway, reliability of findings is the most important characteristic of any NDE procedure. Different methods are used for this purpose, some very traditional as Ultrasonic Method, X-Ray Radiography or the Visual Inspection, others more recent as IR Thermography or Mechanical Impedance Analysis. The physical bases of the NDE by Thermography are well documented in the literature  and the detection of impact damages by IR Thermography has been reported for a long time [3-8]. A recently published paper  gives a review of different techniques applied by different authors, with different equipment to the same specimen. In particular, Early Detection , Lock-in Thermography , Pulse Phase Thermography  and Thermal Tomography  have been used to inspect a carbon fiber composite reference specimen with the impact damage defect. Depending on the case, the specimen was heated using flash or continuous lamps switched on for a specific time. Alternatively, periodically controlled lamp or ultrasound sources were used. Experimental results have been treated in the space, time or frequency domain. Results have been also evaluated statistically, heuristically and by using a few characterisation algorithms . All techniques succeeded in the detection. The use of square pulse heating provided high signals over the defect but reduced ability to resolve details in thermal patterns. The flash techniques are faster and supply more details on the impact damage structure. Using the early detection principle with the resulting depth characterisation ensured the best spatial resolution, being close to the ultrasonic inspection results. In one case, the dynamic thermal NDT was able to find a minor delamination not detected by Ultrasounds. The ultrasonic stimulation of the specimen produces a thermal pattern different from other techniques that could relate to its volumetric nature. Defect evaluation by using thermal tomography and early detection method resulted in the appropriate characterisation of the extension and depth that were found not significantly different from their ultrasonic counterpart. Also, analysis of defect pattern allowed an estimation of the impact damage extension. The NDT reviews are full of works about the use of the ultrasonics for the evaluation of the integrity of composite materials, using pulse-echo, through-transmission or Lamb wave method [10-12]. The reliability and sensitivity of these methods on the detection and evaluation of defect in composite materials is widely known and for this reason the ultrasonic inspection is the most applied technique. The development of automatic system for the surface scanning and the improvement of the software of analysis of the ultrasonic signal allow to obtain reproducible C-scans and to reveal defects, even very small, localised at any depth. Important advances are expected by the development of practical equipment where the generation and/or the detection are produced by laser beams. The Mechanical Impedance Analysis (MIA) is one of the most recent methods of NDT developed to investigate bonded structures, such as honeycomb structures and composite materials, to discover damages that cause a stiffness diminished of the surface . The instrument detects, locates and evaluates defects such as voids, delaminations, inclusions and other similar defects found in materials and their interfaces. MIA is a low frequency non-resonant method employing a continuos wave. The probe contains two piezo-electric crystals; the excitation crystal transforms electrical signal, coming from the instrument, into vibrations and, by the reverse procedure, the modified vibrations on the receiving crystal are converted back into electrical signals. When the probe is on free air, there is no net strain of the receiving crystal. When the probe tip is placed on the material under test, the receiving crystal is restricted, creating a strain and thus an output is produced. The degree of restriction is governed by the local stiffness and mass of material in the structure below the probe. The method has a number of advantages over other bond testing equipment: it is independent of the material type, it does not require couplant, one single transducer is used for all the applications. For the evaluation of defects such as delaminations or voids, the radiography is not the ideal method, because of the very low difference of thickness between a damaged and an intact zone. On the contrary, the use of a radio-opaque liquid, such as Zinc iodide, that penetrates and propagates in the damaged area, allows finding the extension of the damaged areas, visible as a brighter area on the radiographic film. In order to accurately evaluate different methods and techniques, nine CFRP woven fabric specimens (furnished by the Italian Air Force) have been tested in controlled conditions. The laminates are made from "prepregs", manufactured through a pre-impregnation process in which fiber and uncured resin are mixed together. Three thickness have been evaluated, having 8, 10 or 16 plies and then impacted with a sphere-shaped hammer weighting 900 g from three different heights. In such a way the energy of the impact ranges from 3 J up to 7 J. Specimens were also tested with a reference method before the defect formation to ensure the material integrity. The whole set of samples, listed in the tab.1 has been controlled by using the following methods: IR Thermography, Ultrasonic Inspection, Mechanical Impedance Analysis and X-Ray Radiography. The results obtained with some methods have been already published in a previous work . The adopted experimental apparatus consists of an Agema 900 thermographic equipment working in the 8-13 m m spectral band, an heating source realised by 3 flash lamps, having an energy of 3 kJ each and a controlling computer. 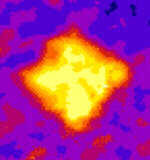 Sequences of thermograms at 12 bit resolution have been stored in real time on a hard disk for the off-line processing. The TNDT procedure used for the reported tests involves a few millisecond pulse. This approach is mostly used for thin and/or rather high-conductive materials, as in this case. Data have been acquired at the frequency of 15 Hz. Both the heated and rear surfaces have been investigated. Many analysis techniques are available to extract detailed information from the thermograms. The first procedure, called Fast Thermal Tomography (FTT)  evaluates the defect size and depth, after choosing a reference sound region. The procedure applies the Thermal Tomography algorithm for the time analysis and a statistical evaluation of thermal signal in space domain. A plot of the normalised thermal signal is recovered, that is the difference between the defect area temperature and the reference one, normalised at the unity. Using the special calibration function the depth of delamination is obtained. In our case, the depths of defect on samples #8/7, #8/5 were estimated at 210 m m and for the sample #8/3 at 385 m m.
A more sophisticated technique, called Pulse Phase Thermography (PPT)  is based on the discrete Fourier transform in the time-domain of the thermograms sequence. The final result is represented by two sets of magnitude and phase images, each one being associated to a frequency in the range [0 - D t-1], where D t is the sampling interval. Among the advantages of these techniques we mention the less sensitivity of the phase map to the optical and geometrical characteristics of the surface and the fact that no information is required about free-defect regions. Therefore, it can be fully automatic. The fig.1 shows a thermogram for the 8 plies sample impacted with energy of 7 J. It is worth mentioning that the thinner samples have been cracked on the surface by the impact. This fact could produce a spurious effect due to the enhancement of the optical signal in correspondence with the surface cavity. Apparently, the defect extension is limited to a cross-shaped area because here the signal is due to the sum of thermal and optical contribution. Instead, the fig. 2 given by the PPT techniques clearly reveals the true defect shape. The results obtained by FFT e PPT techniques are reported in fig. 8. All defects have been detected and reasonably estimated except for the sample #16/3 on the front face. 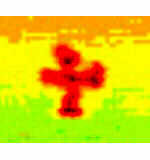 We are confident that for thermography also this defect can be estimated simply adding more flash lamps. In fact, the limited amount of energy delivered by our heat source has been increasing the surface temperature only of about 25 K above environment for less than a second, but a much higher temperature can be supported by CFRP. The experimental work was carried out utilising the pulse-echo method, in an immersion tank, analysing the amplitude of echo from the back surface, and the through-transmission method, by using squirters, measuring the amplitude of the signal passing through the specimen. A computer controlled C-Scan system, connected with the ultrasonic instrument Krautkramer USIP 20, was used. All defects were discovered, also the one presented on sample #16/3, undetected by the other methodologies. In the figures 3 and 4 C-scans of the specimen having 8 plies impacted at energy of 7J, tested utilising pulse-echo and through-transmission method, are presented. In the figure 8 the extension of the damaged areas, measured considering the areas corresponding to amplitude fall greater than 6 dB in respect of the maximum value of the signals in intact zone, is shown. The tests were conducted by using the instrument MIA 3000 connected to an automatic C-scan system Versiscan PC/2. The damaged specimens were investigated evaluating the stiffness of the impacted and back surfaces. The results obtained by using this technique give information about the damage of the plies immediately below the surface. In the figures 5 and 6 the C-scans of the specimens having 8 plies impacted with energy of 7 J, impact side and opposite side, are presented. For some specimens impacted at lower energy, no signal of defect was found. In some cases signals of defect were found only on the surfaces opposite of those where there were the impacts. In almost all the cases the extension of the damaged area on the impacted surface was smaller than that on the opposite surface. To evaluate the extension of the defects the X-ray radiography, after an application of a radio-opaque liquid, was used. A solution of zinc iodide in iso-propylic alcohol was prepared and a drop of it was placed on the surfaces of the specimens, in the areas of impact. Thereafter, a radiographic test, by using an equipment Gilardoni Radiolight, was performed with the following parameters: 25 KV, 5 mA, 45-70 s. In figure 7 the image of the defect of the specimen having 8 plies impacted with energy of 7 J is displayed. The image shows a typical rhombic shape of the defect, with the diagonals along the directions of the woven fibers. The results achieved on the samples by all techniques are collected and shown in figure 8. After the series of non-destructive examinations, a destructive analysis was carried out. The specimens were cut along the lines passing through the points of the impacts and the opened surfaces were investigated after the application of a liquid penetrant. The comparison with the results obtained using NDT methods shows a good agreement, and confirmed the form and extension of the defects caused by different energies. In particular, the visual examination of the section of the defects gave a demonstration of a general rule: for specimens with 8 or 10 plies the extension of damage increases continuously between the impacted side and the opposite side, while for specimens with 16 plies the most defective zones are located in the middle, with very low damages, or even none, on the impact surfaces. The methods used to evaluate the damages generated in specimens were also applied for the investigations of some CFRP structures of a military aircraft. In particular the stabiliser, the fin and the main landing gear (MLG) secondary door of the AM-X were examined. Up to now, for the stabiliser and the fin only the US investigation was performed, hence the comparison between methodologies is not yet possible; the MLG secondary door however was investigated with Ultrasonic Inspection, MIA and Thermography, and the results obtained are shown in the present paper. The MLG secondary door consists of an assembly formed by a NOMEX honeycomb core and a carbon fiber composite skin. A stiffener made from aluminium alloy is located on the upper side of the door and supports the hinge that attaches the door to the fuselage. The opposite side of the door, where the NOMEX finished and the upper and lower skin are joined together, is the area under control for the individuation of delaminations that could be produced during the service-life of the part. The paint of all the parts inspected was maintained and no damage was visible on the surfaces. A surface of about 400 cm2 of the door was heated by flash tubes in 10 ms and the cooling process was observed for 65 s by an IR camera. 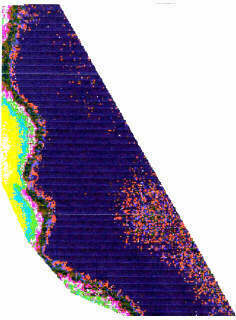 PPT algorithm, applied to the sequence of thermograms provided two synthetic sets of magnitude and phase images. Scanning the maps for the different frequencies and analysing the way the defects behave, it is possible to infer some information about their location in depth. Fig. 9, containing the phase values of the signal components at a frequency of 0.090 Hz, shows clearly three defective areas, A, C and D. An important factor to consider in order to classify defect with respect to their relative depth, is the frequency at which they appear. As far as the thickness of defects is concerned, since the defects we are dealing with are delaminations, we assume their thickness to be the same. Scanning the frequency axis from high to low frequencies, we noticed that defect D is the first one to appear and it covers a wider frequency band with respect to defects A and C. Therefore, we can state that defect D is shallower than A and C. Moreover, A and C exhibit a similar phase behaviour, hence they can be considered at the same depth. Looking at region B in fig. 9, since the phase assumes roughly the same value as in the sound area, it seems that in B there are no defects. Instead, fig. 10, corresponding to a lower frequency (0.030 Hz), shows that between A and C there is a defect that was not visible before and therefore it is deeper than A and C.
In fig. 10 the extension of the whole defect is clearly visible, the internal structure of the sample and the thickness varying, as well. Finally, sharp changes of defects depth are evident from figures 9 and 10, indicating an internal crack of the laminated. Notice that the spot visible at the bottom of both images is due to the reflection of a flash tube and therefore will be ignored. 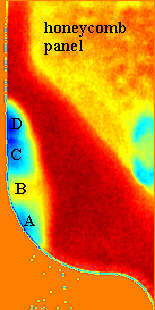 Fig 9: phase map of Thermal Signal according to PPT at 0.090 Hz showing defect at different depth on a the main landing gear secondary door. The bonded carbon fiber composite laminates of the door was investigated utilising the pulse-echo method, conducting a manual scan with the Krautkramer Andscan. A contact probe, with frequency of 5 MHz, was used and the time of flight of the echoes was analysed and represented on the C-scan. The different colours represent difference of the ultrasonic paths. 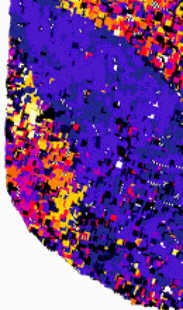 Inner delaminations, visible in figure 11 as bright colours, were found in proximity of the edge, with an extension equal to that found by using PPT. The test was conducted by using the instrument MIA 3000 connected to an automatic C-scan system Versiscan PC/2. The door was investigated evaluating the stiffness of the two surfaces, external and internal, and the C-scans are presented in the figures 12 and 13, in which bright colours represent areas with low stiffness. The comparison with the map obtained by PPT allows to recognise the same defect described as A, B, C and D.
The comparison of features regarding several NDT techniques for the detection of defects on specimens and aircraft structures has been reported in the paper. The ultrasonic C-scan can be seen as the reference method because it is able to measure the defect extension on the whole samples set and structures. All the methods used found almost all defects with good agreement. The results obtained by the different methods confirmed the well-known limitations of them, e. g. the impossibility of the MIA to detect inner defect and the unfitness of radiography in this inspection. About the Thermography, it detected and reasonably estimated almost all the defects, except for the sample #16/3, as other methods, but this limit, in our opinion, is due to the used experimental apparatus and can be simply solved increasing the energy delivered by the heat source. On the other side, the number of tested samples allows to consider results reliable. The test requires only 10 seconds to examine the whole specimen surface. Both a sophisticated and simplified data processing have been applied with good results. In addition a number of geometrical information about defects as the depth and kind of the defect can be achieved by this method. The testing of a real aircraft part represents an important step ahead in the setting up of an effective NDT procedure. No significative problems have been encountered due to the non-planar surface and to the presence of the painting. All the methodologies utilised were able to detect the damages inside the part. The PPT results, obtained working at different frequencies, showed the capability of this technique to find the defects with a qualitative indication about their depths. The same indications were found by using Ultrasonic method as well. The Mechanical Impedance Analysis, if applied only on a single surface, was not able to find all defects inside the part, but the testing performed on both surfaces, internal and external, provided C-scans showing the real extension of the damages and confirmed the defects' depths indicated by the other methods. W. J. CANTWELL, J. MORTON "The impact resistance of composite materials: a review" Composite 22(5) 347-362, 1996. 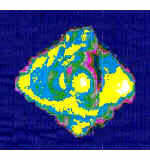 X.MALDAGUE, Nondestructive Evaluation of Material by Infrared Thermography, Springer-Verlag, 1993. L. C. AAMODT, J. W. MACLACHLAN SPICER, J. C. MURPHY "Analysis of Characteristic Thermal Transit Times for Time-Resolved Infrared Radiometry Studies of Multilayered Coatings" J. Appl. Phys., 68, 1990, p.6087-6097. J. C. KRAPEZ, D. BALAGEAS "Early detection of thermal contrast in pulsed stimulated infrared thermography" Proc. of the Eurotherm Seminar 42 "Quantitative Infrared Thermography-QIRT'94", Aug.23-26, 1994, Sorrento, Italy, p.260-266. D. WU, A. SALERNO, B. SCHNBACH, H. HALIN, G. BUSSE "Phase-sensitive modulation thermography and its applications for NDE" Thermosense-XIX, SPIE Proc. 3056, 1997, p.176-183 . X. MALDAGUE, S. MARINETTI "Pulse phase infrared thermography" J. Appl. Phys., 79, 1996, p.2694-2698. 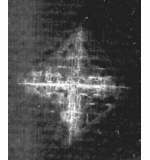 V. VAVILOV, P. G. BISON, C. BRESSAN, E. GRINZATO, S. MARINETTI "New aspects in dynamic thermal tomography" Soviet Journal Non-Destructive Testing pp.419-424, 1061-8309/92/2807-0419 Plenum Publishing Co. (USA). D. P. ALMOND, R. HAMZAH, P. DELPESH, PENG WEN et al. "Experimental investigations of defect sizing by transient thermography". Proc. of the Eurotherm Seminar 50 "Quantitative Infrared Thermography-QIRT'96", Sept..2-5, 1996, Stuttgart, Germany, p.233-238. V. VAVILOV, D. P. ALMOND, G. BUSSE, E. GRINZATO, J. C. KRAPEZ, X. MALDAGUE, S. MARINETTI, PENG WEN, V. SHIRAYEV, D. WU "Infrared thermographic detection and characterization of impact damage in carbon fiber composites: the round robin test results" QIRT98. M. V. HOSUR, C. R. L. MURTHY "NDE of low-velocity impact damage in CFRP composites using ultrasonic" Non Destructive Testing 1992. J. PRASAD "Ultrasonic characterisation of carbon-fibre composites" Non Destructive Testing 1992. M. SEALE, B. SMITH, W. PROSSER, J. MASTERS "Lamb wave response of fatigued composite samples" Review of Progress in Quantitative Nondestructive Evaluation, V. 13B, 1994. P. CAWLEY " The sensibility of the mechanical impedance method of non destructive testing" NDT International 1987.